We are happy to announce that Vanessa G. Howell, originally of Wilkes County, NC, (daughter of Paul & Gail Howell, Sr.) and Jason B. 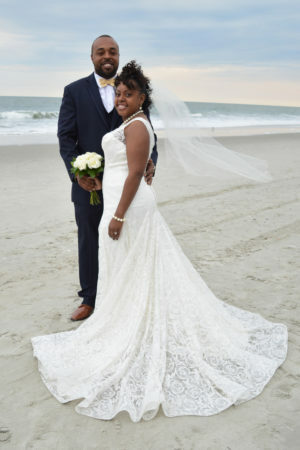 Brown, originally of Reidsville, NC, (son of Delois Jones) were united in marriage on Saturday, March 24, 2018 in the Ivory Chapel at Wedding Chapel by the Sea. Reverand Pam Muise officiated. After a Beach Photo Shoot for Vanessa & Jason with their Wedding Attendants, a reception, including dinner and dancing, was held at the Sea Mist Resort Conference Center. After a honeymoon in North Myrtle Beach, the Newlyweds will reside in Greensboro, NC.